Back in the days of the Bible, there was no pollution, no chemtrails, no city lights, no factories, and no exhaust. Each night, the eerie and majestic arch of our Milky Way galaxy could be seen from the Earth. As I painted this, I placed myself in the desert traveling southwest withthe wise men as they mapped out how to cross field and fountain, moor and mountain. Painting the sky, I felt like Abraham in the Bible when God told him to count all the stars in the heavens. I lost track of the thousands of stars I put in the sky. A good astronomer can even pick outthe constellations I detailed in the southwest portion of a Middle Eastern winter sky. I felt overwhelmed when I realized that God calls each ofthe stars by their own name. 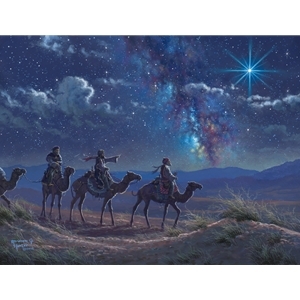 I mean, wow, just imagine with me that you’re in this scene traveling with the wise men on the path of this mysterious new star. These wise men weren’t Christians. They weren’t Jews. They were just people that saw his beckoning light and drew nearer to Jesus regardless of the distance or obstacles in their path. They gave him the best treasures they could think of from their earthly kingdoms: gold, frankincense, and myrrh. Today, these aren’t the gifts Jesus asks of us. From the treasures of our hearts, Jesus only wants us to give him ourselves. With His spirit within to guide us, we are “Following the Light” as modern wise men, still seeking him. This is the true spirit of Christmas. This spirit never leaves us all year if we still seek him. Please join me this year in drawing nearer to the warmth and lightof the Christ child through this painting.